We had a super week in regard to swing trading as markets and stocks did what the charts said they were going to, now it looks like we need at least a few days of correcting and backing and filling before we attempt a new move higher but it was very nice to see the S&P move beyond 1,300. Ideally I’d enjoy seeing the 1,300 area on the S&P tested again this week. As for the precious metals they're doing well, especially silver and palladium but just because gold isn’t really moving up doesn’t mean it’s sick. Gold rose 1.51% this past week and is now trading within an uptrend channel which is now at resistance. 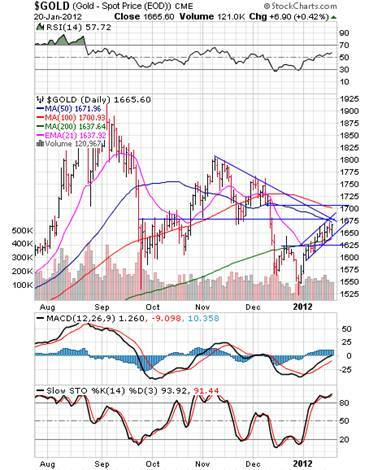 The 50 day moving average is right here along with the $1,675 horizontal resistance level and the downtrend line. All in all the signs are pointing to a rest for gold here. This could last at least three days or up to a week or slightly more. Ideally a $50 range trade between $1,625 and $1,675 would be nice to see with maybe a spike lower on an intraday basis to shake out those week hands. All I’m hearing is that physical buying is so strong at the moment that supply can hardly keep up but the paper games still dictate the price for now so that is our metric of observing the gold price. Volume was about average in both futures and the GLD so it’s hard to say much until we move away from a pattern or technical level. If the above observations don’t quite jive with your hopes just remember that nothing goes straight up ad down forever and if it seems like it will, then the trade is over. While golds reverse head and shoulder pattern of last week morphed into an uptrend channel, silver remained in that nice reverse head and shoulders pattern until Friday when it broke out higher as the downtrend line was approaching that level. It was obviously a powerful pattern, as they usually are, as silver rose 4.72% Friday alone and for the week was up a sweet 7.68%. I mentioned last week that silver was well below it’s 200 day moving average while gold remained above it and the implications I deemed from this were that perhaps silver would lead gold on this next up-move as it has some catching up to do. So far, so good and the 100 day average is the next stop around the $33 level. Then $34 where resistance lies on the chart then the $36 area to the 200 day average. I did not take a trading position in silver Friday as I was more focused on booking some great profits from the week as the markets were very kind to us in regards to our swing trading portfolio. Perhaps next week I will get that chance. In fact our swing trading portfolio was up right about 70% this past week after booking profits which is our best week this year and actually for several months as the markets haven’t been great for trading. The SLV ETF volume was heavy on the breakout Friday which is exactly what we needed to see and now we need a follow though day on Monday with good volume. This move looks like it is for real. The reasons why are both technical and fundamental. Eric Sprott just announced an offering for his silver trust to the tune of $300 million US dollars. This will equate to roughly 10 million ounces of physical silver having to be found and delivered. This news alone should propel silver higher. The fact that a bullish chart pattern was formed and then resolved properly, higher, is even better. Normally this would be stellar news that would have me in a trading position in silver but with the bankruptcy of Kodak (it’s no Kodak moment) they disclosed they have about $300 million worth of physical silver. 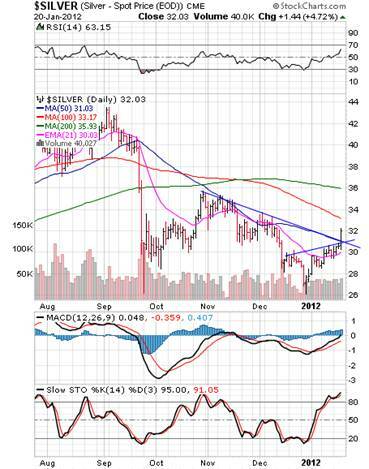 The timing couldn’t have been better and this silver may well fill Eric’s pockets without disrupting the market. It’s really quite curious how many times I’ve seen a pattern form on the charts then a catalyst/news event comes to light and resolves the pattern as it should be resolved. Technical analysis truly can help your investing tremendously and also help clear your mind as you don’t have to think about news and interpret events as much, you just focus on the chart and it’s movement along with volume. I try and live by the KISS (Keep It Simple Stupid) mantra and technical analysis helps me do so to a large degree. Platinum rose 2.20% this past week and continues to move away from it’s recent base and now is even holding above the 50 day moving average. Now we have some resistance at the $1,535 area and resistance higher at $1,579 where the 100 day moving average resides for now. Volume was solid in the futures and the PPLT ETF which is perfect as price moves and now that we are stalled out a tad, lower volume is what I want to see. 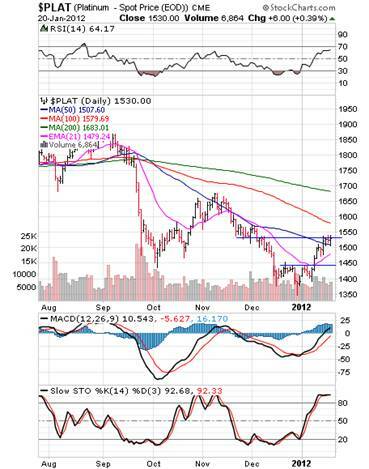 All in all platinum is exhibiting very healthy action that should soon see higher prices. This little 3 to 5 day or so base is what I look for often when trading as they usually lead to higher prices. 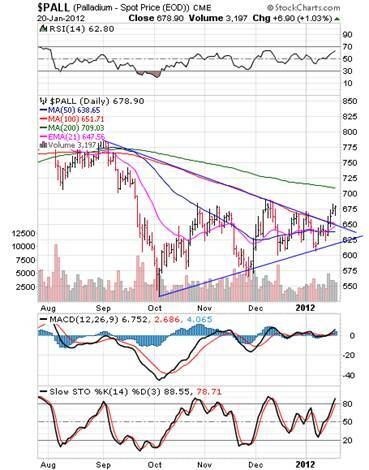 Palladium has risen 6.24% this past week in a superb move out of this large triangle. Volume was heavy and the move could have easily been bought. Unfortunately I usually trade faster moving stocks and was heavy into them this past week and very focused on them. We’re heading to the 200 day moving average at $709 pretty soon unless something drastic occurs. Volume was perfect in the futures and is what you want during a breakout in order for the move to be real and thus able to be bought. The PALL ETF also showed great volume at the correct time. This past week we saw US 10-year treasuries dip below 2% briefly. It is amazing how low the yields have gone. Even more amazing is that people actually accept that rate. It’s not even above the official rate of inflation! Why they don’t seek out dividend yields much higher as we do, I just don’t understand. We get between 10% and 20% annually with our select dividend stocks. Now that is a return. We saw three banks fail this past Friday after the close and kick off this years list of biggest losers. It’s been over a month since we saw a bank fail so it’s nice to get back on track. While this week it was revealed that Newt Gingrich had asked his ex-wife for an open marriage, he himself is open to and open currency. He is calling for a review on how the US can return to a hard currency status, one which is backed by gold. Whether he’s serious or just trying to capture some of Ron Paul’s supporters is debatable though and I try to steer clear of politics for the most part. The high and volatile cost of nickel is forcing Canada to transition to using brass coated steel to produce their $1 and $2 coins, otherwise known as a loonie and a toonie. Iran is hoping to increases their gold production by 350% in an attempt to better their dire economic condition right now which is hefty inflation and many sanctions, neither of which are good, but gold is money and they know that and it will be accepted in trade, period. And for fun here are all the Texas republican candidates agreeing that we need to audit the Federal Reserve. Whether it would ever actually happen is another story and one I won’t believe until I see it. Please sign up to receive my free weekly letter along with any relevant info or articles I write, and if you like what I have to say and think I can help you make some money, and I know I can, then consider subscribing to our daily updates and trading alerts. *To unsubscribe send an email to newsletter@preciousmetalstockreview.com with “unsubscribe” in the subject line.